In Rot@tion! : Experiência Final! A entrevista de despedida dos estagiários LDV. Experiência Final! A entrevista de despedida dos estagiários LDV. 1. Your first impression when you arrived in this new country? Letizia Toni: When I come here I was really impressed about the light, because was night and from the plane I saw so many lights, especially on the bridge. Enrico Fratti: It was strange, all new and all to be discovered. I remember I was excited and scared. Carlo Brandoli: My first impression was really good, I thought immediately that this country would be perfect for me. 2. Where did you do your internship? Did you have any difficulties to integrate yourself in the workplace? LT: I did my internship in the National Museum of Tile, and there I worked with the children and we did some workshops. At the beginning it was quite hard about the language, they pretended immediately to talk just in Portuguese and of course I couldn’t. 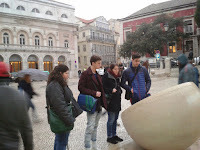 EF: I am doing my internship in a hostel in Lisboa called Rossio Hostel. I have had no problem in my integration in the work place, all the people were always nice with me and I liked my job. 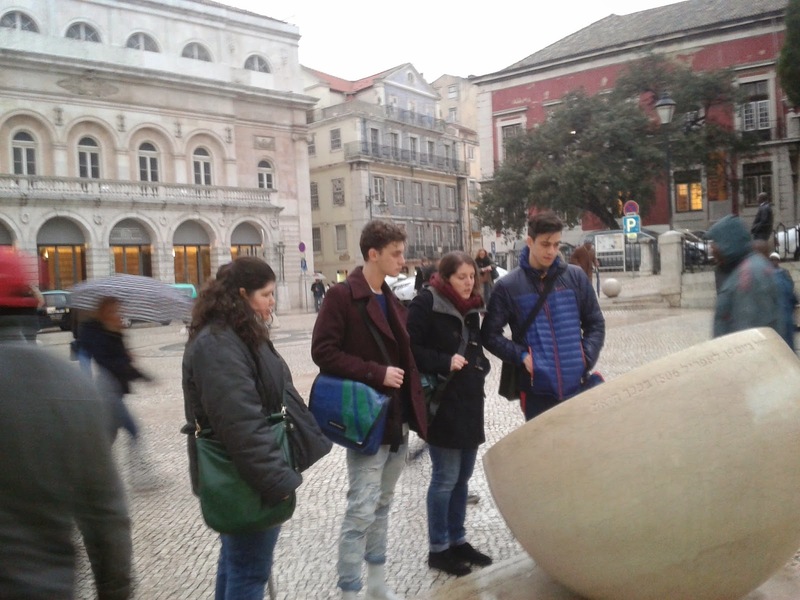 LT: There were mostly different difficulties: one - again - about the language, other about some physical effort: I lived in a fourth floor without lift and moreover Lisbon is built on seven hills so every time when you want go somewhere you have to walk on rise streets. EF: I didn’t find big difficulties during my internship. Maybe the only one was always being nice with guests even if I didn’t want, but I had to do that because of my job. CB: The biggest difficulty was the language, because that one it was new for me. 4. The most embarrassing moment that happened to you with a Portuguese? LT: Every time when I tried to say something in Portuguese but I did some mistakes. EF: I think is better if I don’t describe that moment. 5. The Portuguese word that just you didn’t understand / that didn’t enter in your head? LT: The word bastante, I never remember it. EF: Talvez, it means maybe. 6. Do you think that Portuguese culture is very different from the Italian one? Tell me a custom of Portuguese culture that you definitely can't accept. LT: I think the Portuguese culture and the Italian one are not so different between each other, maybe the Portuguese is more similar with the one of south of Italy. That custom which I definitely couldn’t accept is that one to put milk cream on pasta, because I’ve this intolerance and I can’t eat it. EF: The culture is different but I like it, the only think which is very strange for me is that they eat first and second together in the same plate. CB: It's not so different, but I still don't understand why the portuguese people use so much butter! 7. Our experience here is going to end, what do you bring at home of this three Portuguese months?? / If I could bring home something of Portugal it would ..
LT: A lot of things: especially the beautiful memory about some very nice places like the Monastery of Jerónimos, the Cathedral of Lisbon and that one in Porto, the Museum of Tiles, the Gulbenkian Museum, the Library of Coimbra, the Bookshop Lello e Irmão in Porto, the Nacional Palace in Sintra, Quinta da Regaleira also in Sintra, Palácio de Queluz. Moreover some beautiful beaches on Carcavelos and Cascais. EF: If I could bring home something of Portugal it would be for sure the Atlantic Ocean. CB: For sure the Pastéis de Nata! 8. Would you recommend this experience to another person? LT: Yes of course, I think now when the young people have a lot of difficulties to find a job they can try to have one experience on foreign country. Leonardo da Vinci projects or European Volonteer Service and good options and could be good for everyone. EF: Of course, it is an amazing experience, really useful for yourself! 9. Is there a person who during this experience has been particularly important for you? Which memory about her you take home? LT: Is really hard say something just about one person, I found a very nice colleague at the museum, and as well I found one partner for the culture visits on Martina. EF: Yes, my colleague Maria. She has helped me a lot and now she is like my older sister. 10. Say hello in Portuguese..
LT - EF - CB: Olá!!! Ainda se lembram da Júlia? A Ásia pela ponta dos dedos! Viajar: também acontece em imagens!